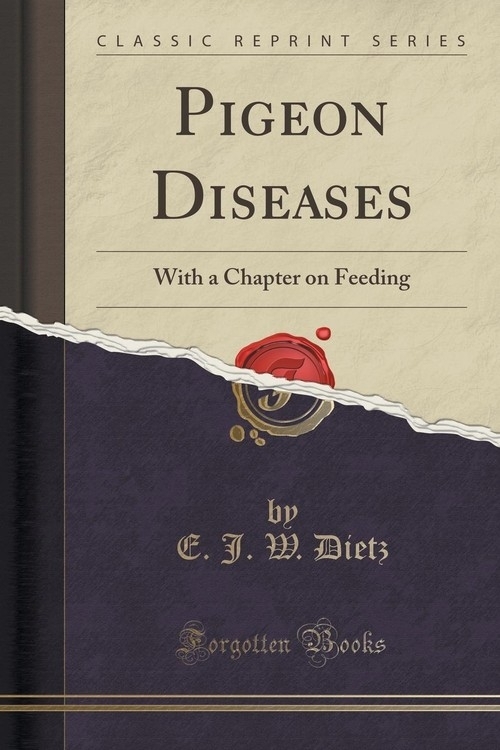 Opis: Pigeon Diseases - Dietz E. J. W.
This treatise on pigeon diseases and feeding management is published in response to many inquiries which have reached the office of Pigeons & Pigeon Flying for information upon the various phases of this subject. In the routine of answering these inquiries, it has been found that no one book heretofore has covered this subject, and much time has been consumed in searching through various pamphlets and, in some cases making inquiries among veterinarians and physicians seeking for remedies and treatments for specific diseases. From this experience the author has been persuaded to compile this information and place it before the pigeon public in the present form in the hope that it will promote the cause of pigeon keeping by lessening the losses, as well as relieving many of our pets from unnecessary suffering. On account of the multitude of sources from which this material has been gathered, it has been impossible to give full credit to the source of the information in every instance. In fact some of the physicians did not want to be quoted. But in cases where the information was obtained from other works, full credit has been given. Many of the remedies and treatments are original and all of such have been tested and tried in actual "fussing" with sick animals in the author's possession. This little work is offered to the pigeon fraternity in the hope that it will be a real benfit and, if any reader finds it lacking, it is desired that he report his experience to the author, to the end that supplements may be added containing information covering every possible phase of this subject. Szczegóły: Pigeon Diseases - Dietz E. J. W.
Autor: Dietz E. J. W.
Recenzje: Pigeon Diseases - Dietz E. J. W.